Forest Protection Limited conducted the first water bombing experiments for the Province using Stearman aircraft. Wheeler Airlines, under Manager George Lovett, is now officially called Wheeler Airlines (1960) Limited. All aircraft flew out of Presque Isle, Maine, June 4-19, 1963. A photo of the Presque Isle Budworm Crew (via Norm Ralston) has an extensive caption that identifies Stearman and TBM pilots along with mechanics, pointers and other assistants. Two Stearman pilots from Simsbury Flying Service of Simsbury, Connecticut, are Bob Schumann and Bert Clements. Bill Merrill of the U.S. Department of Agriculture (USDA) was identified as the Stearman pilot guide. 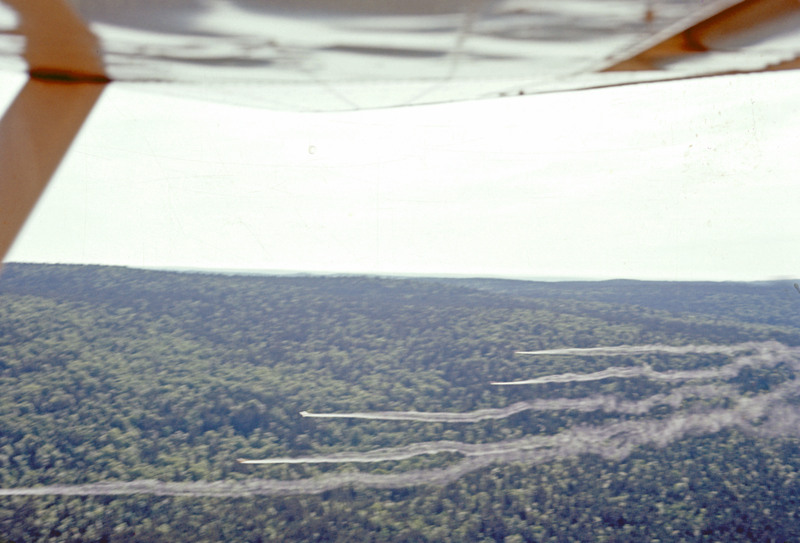 According “Interim Report — 1964 Forest Spraying Program” (Forest Protection Limited unpublished report by Barney Flieger, July 22, 1964), one of only two incidents worth mentioning was a ground loop by a Stearman. The 8 Stearmans operated from Kesnac, and their operations were confined to the forest near the settlements along the main St. John River between Hartland and Prince William. Active Airstrips: Chipman, Dunphy, Juniper (TBMs), Kesnac, Taxis (Stearmans). Trout Brook was built after the spray season. The low volume concentrate (LVC) experiments. Five Wheeler Stearmans were modified for low volume concentrate (LVC) experiments out of Chipman Airstrip, located on the south side of the spruce budworm infestation. The spray apparatus for all five Stearmans was modified according to instructions from the U.S. Department of Agriculture; 36 Mini-spin nozzles were added.